If you've been wondering to yourself how many bedrooms and bathrooms a typical American home has then today is your lucky day. The American Housing Survey for 2009 has a lot of information on American homes. 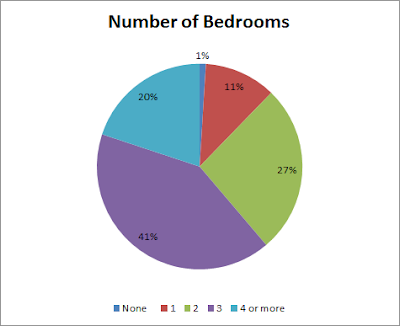 Buried in their data in Table 1-3 is information on the number of bedrooms and bathrooms in homes. 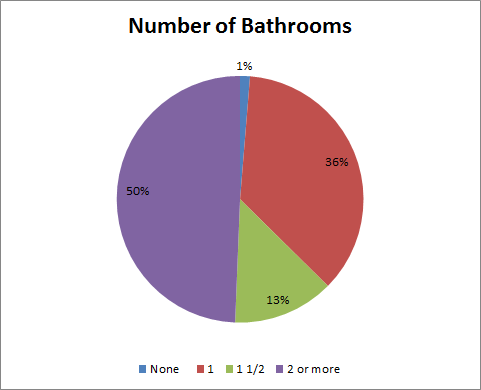 So over 60% of homes have 3 or more bedrooms and half of homes have 2 or more bathrooms. OK OK ...you caught me. I'm probably technically wrong to say that most homes have 3+ beds AND 2+ bathrooms since that isn't really captured in the data and we don't have 100% overlap between the 2+ bathroom homes and the 3+ bedroom homes. But close enough.